With more and more people looking to lower their energy bills, many households are taking on a greener lifestyle. Whether you want to reduce your carbon footprint or you just want to shell out less cash to the electric company, there are some changes you can make in your home to get it done. One of the biggest ways you can lower your energy bills is by replacing your windows with energy efficient ones. Here in Orland Park, Scotts Construction is proud to offer Target Windows. Call today to learn more about them. Now, let’s look at some of the other ways you can reduce your monthly energy bills. A big cause of increased energy bills stems from energy seeping out of your home through cracks in the walls. Pick up some caulk from the hardware store to seal those cracks and you’ll see a definite change. Additionally, adding weather stripping to exterior doors can also help a lot. Consumer Reports found that this one step can help to reduce your overall energy costs by 15 to 30 percent. With how inexpensive and easy a fix this is, it’s silly not to take advantage of those savings. During the summer, your air conditioner is working hard to keep your home at a reasonable temperature. When it’s already hot out, you don’t want to add to the heat by using certain appliances during the day. Avoid using your oven, dishwasher, and clothes washer and dryer until the sun sets to ensure your air conditioner doesn’t have to work overtime to keep it cool. This won’t just lower your energy bills; it’ll also extend the life of your HVAC system because it won’t be strained as much. You would be amazed how much energy is wasted by leaving unused electronics plugged in. Whether it’s your phone charger or a lamp, electricity is still being sent to that outlet, even when these items aren’t in use. Utilize a power strip to make it easy to shut down electricity for all the devices at one time. Something as simple as putting your computer on standby instead of letting it run can save you up to $75 a year. That seems small, but it adds up. If you have the space to do it, hanging up your laundry on a clothesline is an energy efficient way to get your clothes dry. Even if you don’t have room in your yard, try hanging up your clothes with some hangers in your laundry room or bathroom. If you’re still using old incandescent light bulbs, you’re using a lot of energy without getting much use out of them. By switching to compact fluorescent bulbs, you can save over $100 a year. Additionally, these new style bulbs last longer, which means you won’t have to replace them as often. There are many more ways that you can lower your energy bills, but we hope these ideas help you look at your energy usage in a new light. 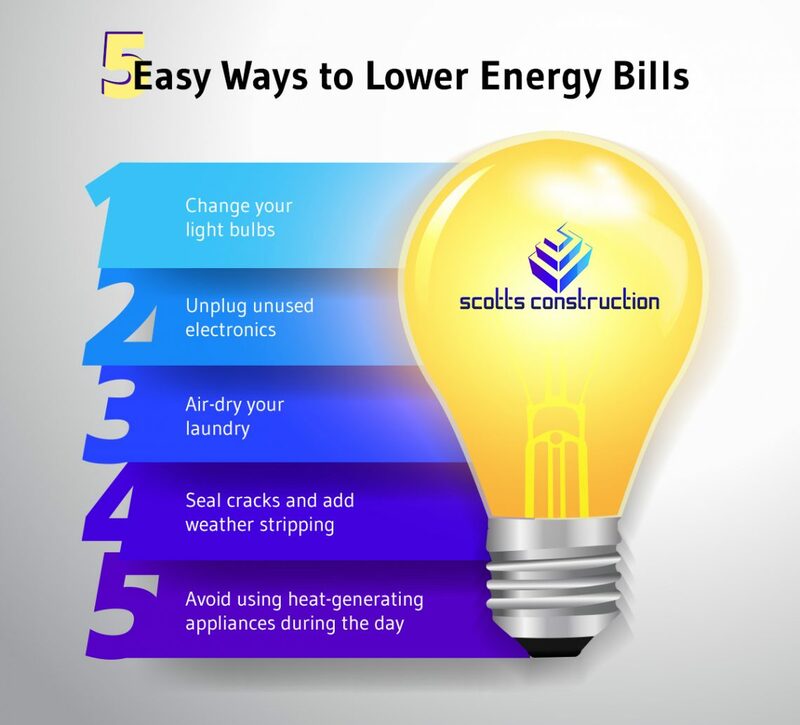 If you want to make your home more energy efficient, call Scotts Construction to learn more.